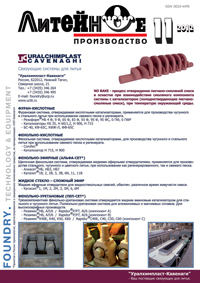 On the base of development of technological and material science bases of receipt of the economical heatproof nickel alloys casts with the directed and single-crystal macrostructure, it is provided their accordance on the level of mechanical, technological and operating properties to ones, made on existent technologies from the traditionally applied materials, at the substantial decrease of prime price. Key words: heatproof nickel alloy, technological return, heart-time treatment, directed crystallization, prolonged durability, high temperature corrosion. In the article there are considered the problems in the manufacture of the press-tool castings. A method of improvement of the complex of technological and operational characteristics, as well as a way to reduce the cost of steel to cast press-tool was suggested. Key words: the crystallization, alloying elements, stamping steel, press-tool, directional crystallization. The article provides a summary of the operation of side frame freight stock. Presents data statistics, describes the causes of frames break, provide a brief review of articles on the topic. The second part of the article deals with the results of joint studies on the technology side of the frame to PJSC "AzovElectroStal." Key words: wagon casting, side frame, casting simulation, ProCAST. The centrifugally cast technology intended to prepare the standard samples of the ferrite phase in austenitic and austenitic-ferritic Cr-Ni stainless steels is presented. Key words: cr-Ni steels, centrifugal castings, ferrite phase, standard samples, homogeneity of the ferrite phase distribution.